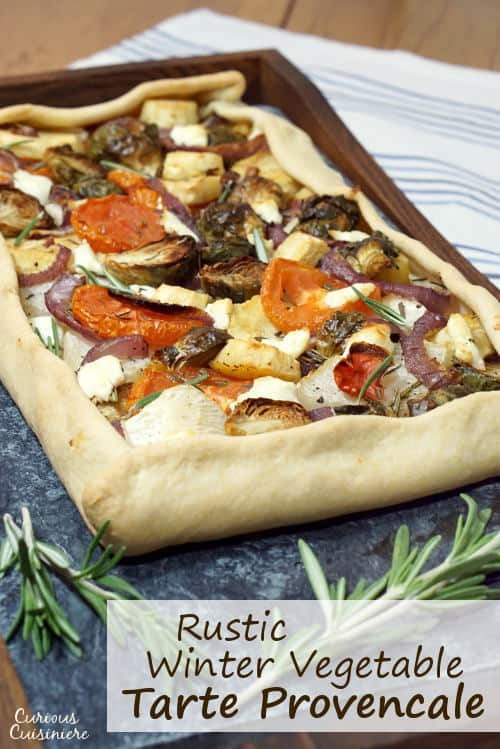 This rustic, free-form Tarte Provencale is filled with flavorful roasted winter vegetables and creamy goat cheese. 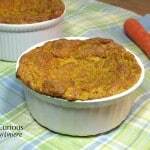 It is the perfect recipe for a comforting winter appetizer. Today, we are excited to be partnering with Uncommon Goods to showcase their beautiful Hot and Cold Soapstone Serving Platter (you can find it here). Their collection of unique products made in the USA is the perfect place to look for that extra special Valentine’s Day gift (take a look here). In France, tarts are quite common to find on a dinner party menu, and for good reason. They are easy to prepare and can be made to feature any number of seasonal flavor combinations. The base is a simple pâte brisée, better known in the States as a shortcrust pastry or, simply, pie dough, which is super simple to whip up at home, particularly with the aid of a food processor. In Province, in the south of France, vegetable tarts are typically filled with tomatoes, zucchini, eggplant, and fresh herbs. It is a Mediterranean region after all, and a Tarte Provencale is a dish whose purpose is to accent warm summer produce in a simple, yet elegant manner. However, that doesn’t mean we can’t enjoy the concept in the throes of winter as well. Winter vegetables are hearty and robust. They have to be in order to keep well throughout the winter. We love them for their deep flavors and for the way they take on a beautiful sweetness when roasted. 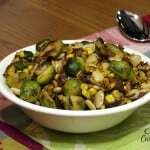 For our tart, we chose to use parsnips, turnips, and Brussels sprouts. 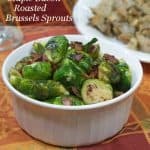 The parsnips lend all of their wonderful sweetness, the turnips give a light cabbage bite, and the Brussels sprouts add their deep notes. While parsnips, Brussels sprouts, and turnips might not be typical of a Provencal table, we’re taking these winter beauties and giving them a Provencal treatment. We round out our tart with a few classic Provencal ingredients, that aren’t necessarily winter-specific, but do give this tart an incredible burst of south France flavor: tomatoes, goat cheese, rosemary, and thyme. We are firm believers that you can never go wrong with roasted tomatoes for their juicy sweetness. Good goat cheese brings a creamy and salty element to all those roasted vegetables. 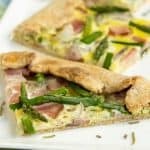 And, rosemary and thyme are two incredible French herbs that give this tart a final “wow” appeal. 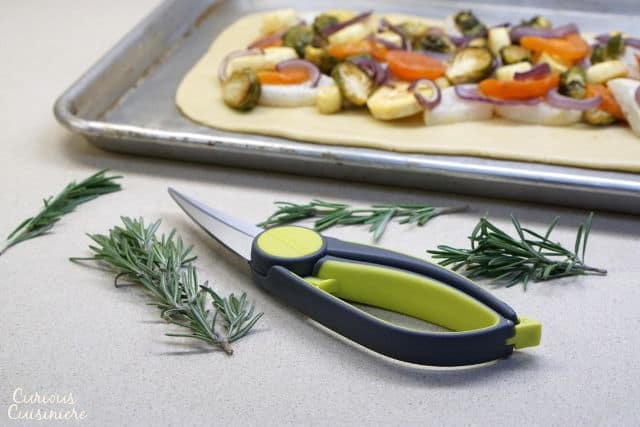 We loved the way the Clip n Strip Shears from Casabella Clean made working with our fresh rosemary and thyme so easy. The first bite of the tart greets you with a crisp, crumbly crust that is buttery with an olive oil robustness. Then, you pick up the slight sweet notes from the parsnips and the pockets of creaminess from the goat cheese that play against the crisp crust. The vegetables are sweet and savory at the same time, with a flavorful infusion of rosemary and thyme. The juicy, roasted tomatoes give a nice brightness and acidic accent to the tart, and everything echoes with a mild, roasted garlic undertone. This tart isn’t just pretty to look at. It is a symphony of flavors and textures in your mouth. For wine, a semi dry Pinot Grigio will play nicely with the light sweetness of the tart, and the minerality of the wine will balance out the earthy rosemary and thyme. What About That Beautiful Platter? The beautiful platter we are serving our tart on is the Hot and Cold Soapstone Serving Platter from Uncommon Goods (you can find it here). 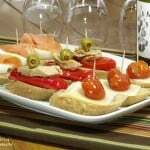 It is made up of two blocks of soapstone which can be warmed in the oven or chilled in the freezer to keep your appetizer spread hot and/or cold. The sleek wooden holder gives you handles for easy carrying. UncommonGoods was founded by Dave Bolotsky, who had a vision to create an online venue to connect artists with individuals searching for special and uncommon goods. They are passionate about supporting artists and designers. In fact, half of what they sell is made by hand and most of their products are made in the USA. In addition, one third of their collection incorporates recycled and/or upcycled material. These truly are unique and uncommon gifts. With their collection of Valentines Day gifts (here) you are sure to find an item as unique as your special someone. Add the flour salt, butter and olive oil to the bowl of your food processor. Pulse until the mixture resembles coarse sand. Add the water, 1 Tbsp at a time, pulsing in between to mix, until a soft pastry dough comes together. Turn the dough out onto the counter and knead it gently a couple of times. Shape it into a ball and wrap it in plastic wrap. Place the wrapped dough in the refrigerator and chill for 30 min. 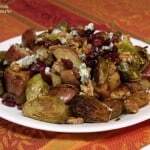 Place the halved Brussels sprouts, sliced turnip, parsnip, onion, and garlic cloves on an aluminum foil lined baking sheet. Drizzle the vegetables with olive oil and sprinkle with salt and pepper. Place the vegetables in the preheated, 400F, oven roast for 15 min. Remove the pan from the oven and stir the vegetables. Add the tomato slices. Drizzle them with a little olive oil and sprinkle lightly with salt and pepper. Place the vegetables back into the oven and roast for 15 minutes more, until lightly golden. While the vegetables are roasting their final time, remove the crust dough from refrigerator and roll it into a rectangle, roughly 8 x 15 inches. Place the crust on a greased baking sheet. When the vegetables have finished roasting, remove them from the oven. Take the roasted garlic cloves and crush them in a small bowl. Using a rubber spatula, smear the crushed garlic paste over the crust. Layer the roasted vegetables over the garlic, leaving a 1 inch border around the edges. Dot the vegetables with goat cheese and sprinkle with fresh rosemary and thyme. Finish everything off with a light drizzle of olive oil. 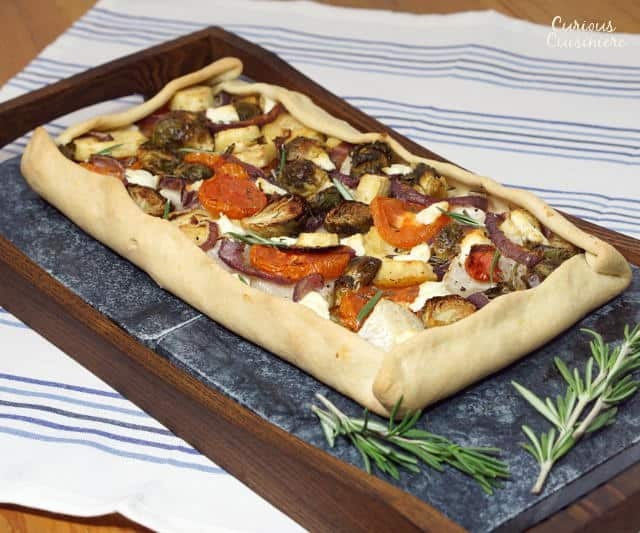 Fold the bare section of the crust inward over the vegetables to create a ½ - 1 inch border. Place the tart in the oven and bake for 25-30 minutes until crust is golden. DISCLOSURE: We received products from UncommonGoods featured in this recipe. We were not compensated for our time. As always, all opinions are our own. How much butter? Don’t see it in ingredients but direction say butter in with flour. Sorry for the missing ingredient Jody. Thanks for letting us know! We’ve updated the recipe. Looks wonderful! 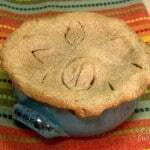 Can the crust be made further ahead of time, or is it better to just use after the 30 min. in the fridge? Hi Alanna, You could make the crust up to a day ahead of time, just make sure you keep it well wrapped in the refrigerator. The longer you refrigerate it, the more firm it will become, so it may need a bit of time to soften on the counter before you can roll it out. Hope you enjoy the tarte! I LOVE this tart. It is so coloful and you KNOW it’s going to taste amazing. I love all of those veggies you used! Beautiful photography, too. I was so in love with all the products at Uncommon Goods! Definitely my go-to for unique gifts from now on. Oh yes. Their products are so fun, and we love that they’re so committed to supporting artists! Absolutely gorgeous! I can’t wait to try this! What a great mid-winter dish! Totally helps you get through the shortest days of the year! I love savory tarts like this, and that’s such a lovely platter as well! Savory tarts are so much fun to play around with! 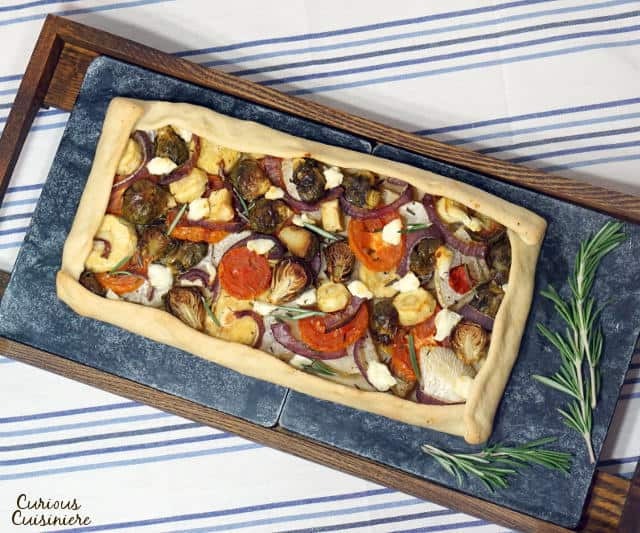 That platter is gorgeous – and this rustic tart is just beautiful!! So elegant for a Valentine’s Day meal. Thanks Rebekah! We do love that platter! 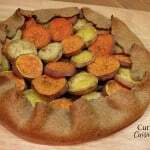 Winter veggies make great roasted tarts and pies. Yum! Haven’t used the snips yet, but they look so handy. Great tart. It looks delicious! Thanks Eliot! The herb shears really are great. We can’t wait for spring to really put them to the test in our garden! You guys always blow me away Sarah. Just gorgeous. Wendy, you are too kind. Thank you! Thanks! It is such a pretty platter! roasted veggies are so good! when i was in france i always loved trying all the different varieties of tarts at restaurants/cafes. yum! We love how there are so many different things you can do with tarts!